It would not be an exaggeration to call leather the first human industry, since the wearing of animal skins goes back to the beginning of human existence. Before early humans mastered the art of weaving, skins from animals slain for food (with and without the fur) were utilized for garments, footwear, headgear, and protective clothing, as well as a host of practical applications, and were linked to warmth and to humans' very survival. Before domestication of cattle and pigs, skins of deer and wild animals, as well as wild sheep and goats were dressed. Paleolithic cave paintings depict figures wearing skins and furs, and excavations at these sites have revealed an active leather industry. Flint instruments, including knives, scrapers, and awls used for removing flesh, have been found in addition to wooden poles and beams used for beating and draping hides. Later Neolithic and Bronze Age sites have yielded leather dagger sheaths, scabbards, shields, footwear, and jerkins of a sophistication that indicates that leather manufacture was mastered early in human history. As humans learned to domesticate cattle, horses, sheep, goats, and pigs, the availability of raw materials for leather production swelled. Uses of leather by ancient peoples included all types of clothing, belts, thongs, footwear, headwear, gloves, ties, bags and vessels, armor, sheaths, packs, seat covers, saddles, animal trappings, tents, and even sails for ships. Excavations of Sumerian peoples at Ur of the Chaldees brought to light extraordinary leather tires used on wooden wagons. In the early 2000s, the Masai women of Africa were clad in cloaks and petticoats of leather, which harkened back to the earliest years. Prehistoric humans quickly discovered that raw skins removed from the animal needed to be treated before they could be useful. Indeed, leather is a manufactured product that requires many steps. The series of chemical processes by which natural skins are converted to leather is known as tanning. The object of tanning is to render natural skins impervious to putrescence while imbuing them with greater pliability, suppleness, and durability. Early tanning methods employed natural substances, in contrast to modern manufactured chemicals. However, before tanning can occur, the skins must be clean. Hides are washed of blood and dung and the hair removed. This process is not actually tanning, but a necessary preliminary step done by early peoples in a variety of ways. Some utilized alkaline substances to loosen hair, such as lime found in ash; others utilized urine to accelerate putrefaction and hair loosening; while still others such as the native Inuit peoples employed the enzymes in saliva via the chewing of skins. All cultures have employed stages of stretching and scraping of skins to remove flesh and hair prior to the actual tanning process. 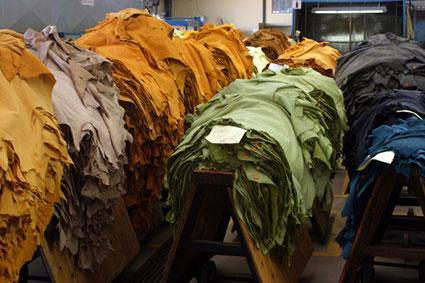 The three historical methods of making leather are vegetable, oil, and mineral tanning. Oil tanning is considered to be the oldest process, probably employed in combination with smoke curing. Neolithic excavations have revealed elk and deerskins dressed with oil and smoked. Traditional oil tannage methods employ fish oils (of which cod oil is the most important) or animal fats worked ("stuffed") into the hides to bring about oxidation, transforming skin into leather. Variations of oil tannage include the milk and butter used by nomads of Central Asia (Kyrgyz) and egg yolk tannage by peoples of northern China. Native Americans of North America are known to have tanned leather with a mixture of brains and oil. Smoke curing in pits has a long tradition in China. Vegetable tanning, a 4,000-year-old process, was developed widely across the world by ancient peoples utilizing their own local flora. Plants containing tannins (compounds of gallic acid) infused in water were discovered as early as the Paleolithic period to affix to skins forming an impenetrable substance. Egyptians preferred using the mimosa plant for tanning purposes, while peoples of the ancient Mediterranean employed sumach leaves. Oak (and pine) bark, nuts, and galls have been the most important sources for tanning compounds in Europe, practically until the advent of chemical processes in the nineteenth century. Mineral tanning, until the modern age, meant alum. Ancient peoples mined alum for tanning skins in a process that became known as tawing. Tawed leather produced a supple, distinctive white leather and developed into a specialized guild in medieval Europe. Alum-tanned leather was developed to a particularly high standard in the Near East. The Moors, who conquered Spain in the eighth century, brought with them their expertise in this process; and the precious leather goods they produced, referred to as cordovan or cordwan, were indelibly associated with the city of Cordova, Spain, giving rise to the name of the leather shoemakers in England, known as cordwainers. Combination tanning, utilizing more than one method, was also exploited in making leather. The importance of leather goods in all aspects of daily life made it a highly desirable trade item. Primitive peoples who needed leather for clothing, weapons, and other applications bartered goods for leather products. Leather became so vital to the flourishing of communities that it progressed into a form of currency. It has been used as money continuously throughout history. The historian Seneca noted that Romans used stamped leather money in 2 C.E. ; so did the ancient Chinese early in the second century B.C.E. Even in sixteenth century Russia, leather pieces stamped with Czar Ivan IV's symbol were being used until metal currency took hold during the reign of Peter the Great. While leathers were often left with their simple tanned finish, the urge to color and embellish tanned leather has an equally early history. Coloring leathers was achieved through animal, but predominantly vegetable, dyes in combination with metal salts. Tawed leather accepts dye well and was a skill refined by ancient Phoenicians and Egyptians as indicated by the find of a 4,000-year-old fragment of leather dyed with kermes. Egyptians also employed safflower to stain leather. Indigo, woad, buckthorn, and hollyhocks were at various times utilized to dye leather in combination with mineral mordants. In addition to coloring, leather has also been decorated by peoples around the globe in various ways, including tooling, painting, embossing, pleating, perforating, plaiting, and embroidering to suit their tastes. Interestingly, the tanning of leather was one of the last industries to lift itself out of medieval conditions in the nineteenth century. Before then, methods had endured for centuries. Modernization since the late nineteenth century, however, has been swift and complete, and what used to be a craftsman's art has become increasingly a science handled by technicians. Mechanization has brought significant changes in speed and efficiency. Prior to specialized drum machinery, liming the skins, tanning, and dyeing was manipulated by hand. A wider range of tanning materials has also been introduced. Mineral tanning through chromium salt, which produces a supple, versatile leather, is by far the most widely used method of tanning in the early twenty-first century. Even more significant are the myriad new methods of dyeing and finishing that have revolutionized the modern leather industry. Since their invention in 1856, aniline (synthetic) dyes have become universally standard in dyeing leather, producing an enormous range of colors and shades. This had a major impact on leather fashions in the twentieth century, bringing about innovative new looks hitherto unknown in natural leathers. Like dyes, finishing methods have revolutionized leather fashion. In the early 2000s, imperfect skins of any type-cow, pig, sheep, and goat-can be made to look identical to any other skin through sophisticated finishing processes such as sanding, plating, embossing, dyeing, and spraying. Pigskin, traditionally tough and used for shoe leather, has become an important and versatile garment leather through the modern finishing treatments, which represents a huge export product for China. Bulk industrial tanning is done less and less in Western Europe and America, having been shifted to India and the Far East, for economic reasons. Some of the finest leather continues to be tanned by traditional methods, although it represents a tiny fraction of leather produced in the early 2000s. Among the most superior fashion and upholstery leathers are those processed by traditional vegetable tanning, piece-dyed by hand, and rubbed with oils to achieve a rich finish. Much of this luxury leather is produced in France and Italy, although a new industry is emerging in South America aimed at the high-end garment and fashion accessory market. See also Leather and Suede. Gansser, A. "The Early History of Tanning." Ciba Review 81 (1950): 2938-2960. Hamilton, William L. "The Private Life of Club Chairs." New York Times (22 January 1998): F1. Issenman, Betty Kobayashi. Sinews of Survival: The Living Legacy of Inuit Clothing. Vancouver: UBC Press, 1997. Kaufman, Leslie, and Craig S. Smith. "Chinese Pigs Feed a Western Fashion Boom." New York Times (24 December 2000). Reed, Richard. Ancient Skins, Parchments, and Leathers. London: Seminar Press, 1972. Waterer, John William. Leather in Life, Art, and Industry. London: Faber and Faber, 1946.